The number of visitors to Sarasota County in the current fiscal year — which began Oct. 1, 2015 — is projected to climb 5 percent, and visitor spending is expected to rise 3 percent, members of the Sarasota County Tourist Development Council (TDC) learned during their Jan. 21 meeting. The record number of tourists to the county who stayed in paid lodging in the 2015 fiscal year — 1,084,140 — accounted for a total economic impact of $2,662,422,701, a 12-percent increase over the FY 2014 amount, Virginia Haley, the Visit Sarasota County (VSC) president, told the TDC members. In the 2015 fiscal year, growth in tourism was 9.3 percent compared to the FY 2014 figure, VSC data show. VSC data showed that 87 percent of them were Caucasian, 4 percent were African American, 4 percent were Hispanic and 2 percent were Asian. Most of the tourists — 78 percent — learned about Sarasota County through the Internet, Haley said, as indicated by research undertaken for VSC. For example, 28 percent of them went to the Visit Sarasota website, while another 32 percent checked the websites of area hotels and 24 percent looked at TripAdvisor recommendations, according to a chart VSC provided to the Tourist Development Council. On a national basis, Haley continued, economists have been puzzled over the past three years because “the spending on travel has far outpaced the rest of the consumer spending” — 28 percent to 14 percent, respectively, data show. As a rule, she pointed out, visitor spending parallels consumer spending. Her numbers showed tourism up 2.9 percent for the U.S. as a whole in FY 2015, while the Sarasota County figure was 3.5 percent. Nationwide, Haley noted, the prediction is for a 2.2-percent increase this year. 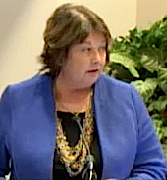 Another positive factor for Sarasota County was that “unemployment reached an all-time low in the [United Kingdom on Jan. 20],” Haley told the board, and that is the county’s strongest international market after Canada. A chart she showed the TDC indicated visitors from Europe to Sarasota County numbered 108,790 in FY 2015, compared with 105,820 in FY 2014. “Our strongest UK markets are looking really good,” she said. To facilitate travel from that region — as well as from Germany and South America — she explained, she and her staff are working with tour operators who have good track records for bringing people from those areas to Sarasota County. The latest figures for the county’s Tourist Development Tax (TDT) collections showed that while revenue did climb in November 2015 — the second month of the current fiscal year — it was up by only $4,923.73. The total for November 2015 was $966,724.85 as of Dec. 31, according to the Tax Collector’s data. 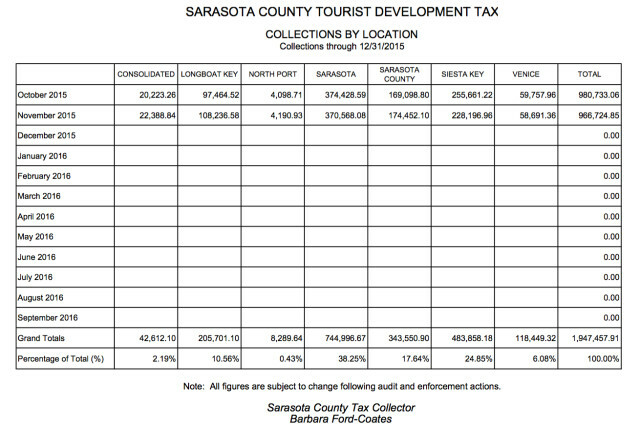 In November 2014, revenue was $145,375.08 higher compared to the amount collected in November 2013, Sarasota County Tax Collector records show. The latest November figure may be modified later, however. The entities that report collections must supply that information to the office by a certain date each month, so more complete, subsequent accounting can lead to changes, Tax Collector Office staff has explained to The Sarasota News Leader. 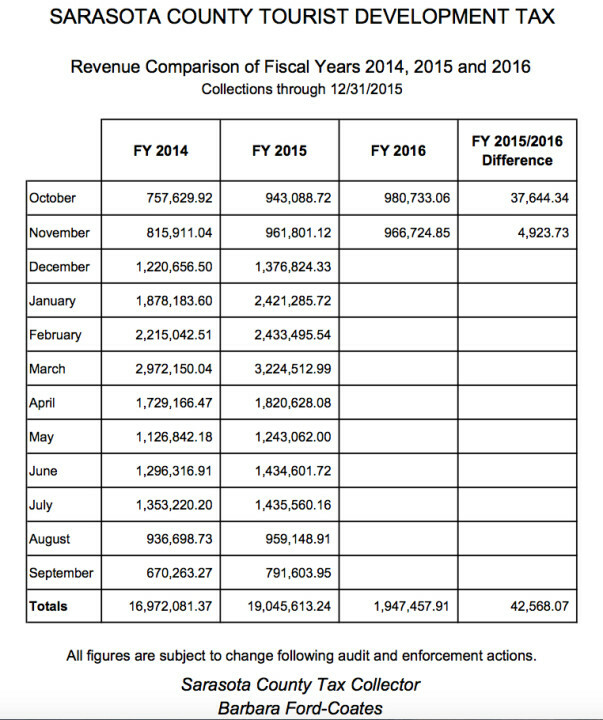 Thus far, as of Dec. 31, 2015, TDT revenue is up by $42,568.07 compared to the same period in the last fiscal year. In terms of location reporting, the City of Sarasota is leading the way through the first two months of the 2016 fiscal year, records show. It accounted for 38.25 percent of the TDT collections for October and November 2015. Siesta Key was in second place with 24.85 percent of the total. Why not think about the other consequences to this relentless building of skyscrapers everywhere leaving no swatch of grass untouched. Traffic, noise, pollution, crowds everywhere in downtown shopping and dining…There seems to be no balance in this city and the theme is always “great for the economy, great for downtown.” Well, it is NOT so great for those of us who used to enjoy the beauty and tranquility of this city. Developers pockets are getting deeper and deeper and residents don’t seem to have a say. In fact they are never asked.